This is the same format as my last post. I just had to see how it would look in Basic Black and Lovely Lipstick colors! SO SNAPPY!! Black pops ALL colors!! My recent class attendees selected this design as the class favorite!! It has broad appeal for many occasions. One of those "GREAT TO HAVE ON HAND CARDS!" This Wishing You Well Stamp Set #147864 first appeared in the 2018 Holiday Catalog and is STILL AVAILABLE!! This is such a quick card that uses Mossy Meadow and Gorgeous Grape ink pads! LOVE the FRESHNESS of Gingham Gala 6 X 6" Designer Series Paper #148554! Generous demonstrator discount (20-25 percent). Flexibility in setting your hours & working from home. Support from creative resources: quarterly magazine, demonstrator website with training, Stampin' Connection, & Demonstrator Business Web Services. Opportunities to purchase new Stampin' Up! products early. Quick Start program, earn FREE products. Stampin' Up! events: stamp, learn, and have a blast with fellow Stampin' Up! lovers! I have 22+ years of experience to guide you. I wish you could see this card in person! 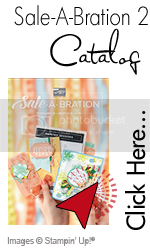 The Country Floral Dynamic Embossing Folder is a FREE Sale-A-Bration Promo item when you purchase $50 of any product (in the US.) It's VERY detailed and sooo pretty!! I used Sponge Daubers #133773 and subtle inks to lightly color the raised impressions. The finishing touch is Silver & Petal Pink Baker's Twine #146288. It's a very quick card. MORE free Sale-A-Bration items are now available for you to choose from when you place a qualifying order of $50 or $100 (in the USA.) We LOVE FREE!! Stock up! No Limits! Click the WIDGET on the right labeled: SAB 2. Painted Seasons By Stampin' Up! 2019 Sale-A-Bration Second Release offers this LOVELY, dist'ink'tive © Painted Seasons Bundle as a FREE item with a $100 purchase in the US. It's amazing 7 cling images cover all four seasons! I've added background interest using the Timeless Textures Stamp Set #140517. A sweet card for many occasions! AVAILABLE BEGINNING FEB. 15, 2019: This is Painted Seasons Bundle, a FREE item with a $100 purchase of ANY products during Sale-A-Bration Promo (in the USA.) I paired the lovely hand-painted imagery of flowers with the Happy Birthday Thinlits #143700 die cut in Champagne Foil #144748. This bundle also comes with Painted Seasons Designer Series Paper which I did not use on this project. This lovely stamp set is only available through March 31st when Sale-A-Bration Promo ends. Don't wait to order and earn it! Forever Lovely Bundle by Stampin' Up! These DIES are versatile and FUN!! This white layer was created using THREE dies: The edgelit die with the flowers and two corner dies of "dots." Since they are three separate dies, the layer can be ANY SIZE!! All My Love Designer Series Paper #148576 is so pretty in Lovely Lipstick and Crumb Cake colors! Forever Lovely Bundle #150580 of 13 stamp images and 14 dies saves you 10%!! Here is a cute FANCY FOLD card created with the bright and bold Happiness Blooms Designer Series Paper #148795! This is called an INTERLOCKING GATE FOLD. It's simple! The designer paper is cut to 3-3/4" X 1-1/4". It is layered onto Lovely Lipstick card stock cut to 4" X 1/1/2". Make three and attach them alternately to half of the front of the white gate-fold card base. These designs are FUN to create with!! Shop & Earn FREE items here!! Doesn't this sweet bunny look like Beatrix Potter's PETER RABBIT?? He is perfect to welcome a baby, celebrate Easter, announce Springtime or "just because!" I used the wonderful Stampin' Blends, alcohol markers to color the bunny. I truly enjoy coloring with Stampin' Up! 's Blends alcohol markers!! These colors are Mango Melody Duo and Dark Highland Heather...very springy! The flower centers are shimmered with Wink of Stella #141897 which dries quickly and does not shed! Inside. This is a great card to have ON HAND for immediately use!! Shop & earn FREE Items During Sale-A-Bration Promo!